At Thinkers Café, a dimly lit café near Peking University, Yan Lianke chooses a side table with a desk lamp that flickers on and off as we speak. The outspoken author and ex-military man is strikingly mild-mannered. Yan enlisted in the army when he was a teenager. He spent the next two decades as a military propaganda writer, while testing the state censors' limits and his army superiors' patience with an increasingly ambitious and politically pointed series of short stories and novels. Eventually, after the publication of The Joy of Living, a story about a village of disabled peasants, Yan was asked to leave the army. His next two novels, about impoverished peasants who contract AIDS via illegal bloodselling and starvation during the Great Leap Forward, have both been banned in mainland China. A story that asks how a tiny village can be transformed into a giant metropolis within decades. Everyone says it's because of economic reform, because of opening up, but I don't think China's success today was driven by mere power, money, or idealism. The first book you wrote that was censored was Serve the People!—since then, Dream of Ding Village and Four Books have been banned in mainland China. How has your attitude toward the censorship of your work changed over time? I used to think: OK, if you won't let me write about this one thing, I'll find something else to write about. But then I found that I had become a controversial writer, I began to think: what is wrong with my work? Editors who were gentle with other writers were treating my work with suspicion. People believed that I had betrayed Chinese society. Every Chinese author thinks that their own writing is free and uncurbed, but only because we're not aware of the restrictions we have internalized: the most chilling thing is the way we censor ourselves. We need to acquire a degree of inner freedom. We can't blame everything on the state censors. In your essay, you describe writing as your “democracy and liberation." Can you elaborate on why you said that? To understand ourselves and the people around us, we need to start by liberating ourselves. If censorship is the most significant constraint on our writing, why did the former Soviet Union produce so many celebrated writers despite the Great Terror, and why haven't we? China is a great environment for an author, because such implausible things happen in everyday life. For instance, the AIDS villages [in which impoverished villagers who sold their blood for cash contracted AIDS via contaminated needles] were a big deal, but no sooner had we started paying attention to them than something else became a big deal. These incredible events happen one after another like waves. Many people would rather focus on the fact that China is making progress and people's lives are getting better. Are they right? Most people don't care for civil rights or a democratic say. I am disappointed by the generation born after 1980. They hang on to their ignorance: give me money, they say, give me an apartment. Everyone has vested interests, including the intellectuals. If the literary scene were to change, the pitiful degree of power and recognition they now enjoy would become worthless. You've written about how even your mother and siblings don't understand why you are so critical of the government. If my brothers and sisters don't understand me—well, they live in the village and haven't read my books. My loneliness isn't driven by my family's attitude or the number of readers I have: it stems from the way that other writers look at me. Out of a hundred fellow writers, ninety-nine keep a distance from me. Knowing that it might not be published, for whom did you write Four Books? Was it for the intellectuals to whom the book is dedicated? I simply wanted to portray a time period that has been forgotten, even by intellectuals. Memories of the starvation only live on in the villages, where our grandparents can tell us how much they suffered, how many people died. Our children don't need textbooks to tell them what happened, because textbooks can only give you facts. I simply wanted to portray a time period that has been forgotten, even by intellectuals. Memories of starvation [during the Great Leap Forward] only live on in the villages. Our grandparents remember how many people died, but our children only read the statistics in textbooks. To them, it's just a historical event. You've said before that you wanted to write about Tian'anmen sometime—do you still? Not right now. Given that Four Books was impossible to publish, writing about June 4th would only make my work even more misunderstood. Perhaps if the book I'm working on right now gets published, I'll think about it. I always have a few story ideas in mind, but when the novel gets written doesn't just depend on whether the story itself and my writing technique are ripe for it—it also depends on whether the timing is ripe for that story. If I write about June 4th now, people will just say I wrote about it to give Western readers what they want. They think that I don't want to be published, but the opposite is true: in my heart of hearts, I long to be published. I don't want a large readership. I want to liberate my writing as much as possible, and I want my work to reach readers. I've turned fifty, and I'm aware that time is running out—when I reach seventy I won't be able to write like this, so while I still have the imagination and energy, I want to write novels that are true to my vision for them. Living in China gives you, as a writer, an explosive degree of energy. Perhaps if we had one hundred percent freedom, we wouldn't be able to write anything. Find out more about the Tiananmen Square protests and government repression in this interview, also from China. Yan Lianke comments, "the former Soviet Union produce[d] so many celebrated writers despite the Great Terror . . . " Read a poem from Marina Tsvetaeva, now one of Russia's most celebrated poets, who was persecuted, along with her family, during the Stalin era. A campaign of political repression in what was then the Soviet Union, and is now Russia, Ukraine, and other countries in the region. Beginning in 1936, Joseph Stalin's regime arrested, imprisoned, tortured, and murdered millions of innocent people. The Tian'anmen (or Tiananmen) Square protests. In the spring of 1989, more than a million students and residents of Beijing rallied in Tiananmen Square, calling for greater freedom, democracy, and other reforms. It was the largest protest in Chinese history. The Chinese government brutally suppressed the protests, killing and arresting protesters. First published in English in Words without Borders' November 2012 issue: Banned Chinese Writers. Yan Lianke, one of the authors featured in WWB Campus's China collection, has a new novel out. By Georges Seguin, 2010. Yan Lianke was born in 1958 in Henan Province, China. 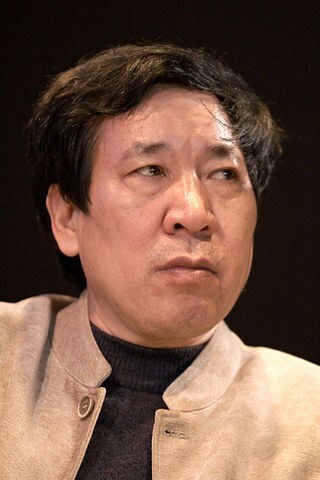 He is the author of many novels and short-story collections and has won China's two top literary awards, the Lu Xun in 2000 for Nian, yue, ri (The Year, the Month, the Day) and the Lao She in 2004 for Shouhuo (Pleasure). The author Yan Lianke in 2015. By SEEI, public domain. Find out about more about Yan Lianke's past and present in a 2018 New Yorker profile that explains "How an Army propaganda writer became the country’s most controversial novelist." Read Yan Lianke's writing on the "amnesia with Chinese characteristics" that has especially affected this generation of students and the role of writers in China, a "nation that is thriving yet distorted, developing yet mutated." Yan Lianke says, " . . . the most chilling thing is the way we censor ourselves. We need to acquire a degree of inner freedom." Read more about self-censorship in China. Find out how Chinese author Ha Jin attempts to avoid self-censorship in "Exiled to English" on his choice to write in English. Read about the controversy surrounding Mo Yan, the Chinese writer and winner of the Nobel Prize of Literature. Liao Yiwu, for one, has protested the award, calling Mo Yan a supporter of censorship. To read two differing views on the debate, read "Why We Should Criticize Mo Yan" and "What Mo Yan's Detractors Get Wrong." Read "China Sharpens Its Censorship Blade," a Beijing native's perspective on the censorship—or the "monopoly over information"—in China. Find out about two American writers' experiences with censorship (or self-censorship) in China: Peter Hessler on his experience with his own censor while in China, and Evan Osnos' account, which also includes some history of Chinese literary censorship. Author Salman Rushdie in New York City, 2008. By David Shankbone. Read an interview with Salman Rushdie about censorship in China, and his essay: "On Censorship." Watch a trailer for the documentary The Blood of Yingzhou District, which tells the story of one of the villages affected by AIDS in China. Look at the documentary's website for more information. Then, watch the follow-up documentary, The Children of Yingzhou District Revisited, to see the changes that happened in the ten years following the original. Read about starvation during Mao's Great Leap Forward: Mao's Great Leap to Famine, in the New York Times. Find out writer Chan Koon-chung's take on other writers' criticism of Yan Lianke in another interview by Chenxin Jiang in Words without Borders. Take a look at Yan Lianke's latest "exploration of China’s nightmare underbelly," (as Paper Republic put it) in the novel The Day the Sun Died; or read a short story published online, "England and My Clan." Finally, watch Yan Lianke talk about writing in China at UC Berkeley. See a literary portrayal of the Great Leap Forward in graphic literature from WWB: "A Great Step Forward: Memoir of the Famine." Watch the WWB interview with translator Wenguang Huang, who was among the protesters at Tiananmen Square, below. Read Liao Yiwu's speech "This Country Must Break Apart," advocating an end to China as a nation, also on WWB Campus. To read "under-reported," often censored, stories from around the world, visit Global Voices and browse stories in Reporters Without Borders. Then, find out about far-reaching disruptions of programs like Gmail, Facebook and Flickr in the New York Times piece “China Clamps Down Still Harder on Internet Access.” Don’t miss the second half of the piece, which introduces some ways the government is trying to foster global economic connections. Then, read a more recent article, "Horns Honk, and Censors in China Get a Headache," about a crackdown on a humor site; and "Chengdu Cool," about the rise and censorship of Chinese hip-hop. How does the Chinese government view its own censorship? Watch China’s Cyberspace Administration employees perform the song “The Mind and Spirit of Cyberspace Security,” translated into English. Also, read an article from ProPublica. To find out more about the Tiananmen Square protests and the government crackdown on June 4th, read "Interview with Wu Wenjian." Read poems translated by Chenxin Jiang.